American Family Association has taken a timeout from gay bashing to do some Muslim bashing. After all, AFA is designated a hate group for many reasons. Southern Poverty Law Center is not going to remove the designation anytime soon. That's not attributable to the folks at SPLC. It is because AFA is hateful and it employs hateful people. National security analyst and terrorism expert Brigitte Gabriel is concerned that a radical Muslim may be elected to Congress from Michigan. 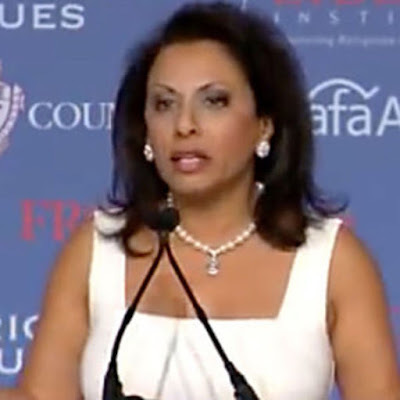 Brigitte Tudor — aka Brigitte Gabriel — is the founder of ACT for America. It is the largest anti-Muslim group in the United States. Gabriel specializes in propagating insane conspiracy theories designed to make people fear Muslims. She does this by intentionally confusing radical Islam with all Muslims. Gabriel has suggested that it is impossible for Muslims to be good citizens. She also claims that Muslims have infiltrated our intelligence services. Regarding Muslim immigrants, Gabriel insists that they are a source of numerous communicable diseases. Those refugees and their employers — like Chobani Yogurt — are also part of a conspiracy to trash American values. Those employers, Gabriel charges, are bribing city council members so that they will approve of refugees. That makes no sense at all but Gabriel has a cult-like following who believe every crazy utterance. One of the Democrats in the 13th Congressional District primary is Rashida Tlaib, who is already the first Muslim woman elected to the Michigan Legislature. She wants to become the first Muslim elected to Congress from Michigan. Tlaib also wants to create special rights for Muslims and other minorities by expanding the Civil Rights Act of 1964 in a way that would shield "communities of color" from a whole host of negative outcomes, including racial profiling by police, utility shutoffs for delinquent bill-payers, and the denial of a bank loan based on a bad credit score. "She's on the left of the left. And she is promising anything – all the freebies," Gabriel tells OneNewsNow. "[She's telling her supporters] if you cannot qualify to buy a house, if you have a bad credit rating, it will be discrimination – and if they don't give it you, you're going to be able to sue them. We will basically have anarchy." So now it's not because she is a Muslim in spite of the fact that Gabriel is an anti-Muslim activist? I have looked at the Tlaib's campaign website. She does want to expand the Civil Rights Act and she does want a fairer society. I certainly don't see anything that would create "anarchy." Challenge mortgage, business lending, and other bank practices that systematically steer minorities into higher cost products or that deny homeowners and businesses owners access to credit regardless of their income, credit and ability to pay. When it comes to a fairer society, Tlaib is a true believer. I don't agree with some of her proposals but that is just what they are; proposals. They require votes in both houses of Congress and then the approval of the president. I have been an unwavering ally of the LGBTQ community and will fight relentlessly to ensure that no matter how you identify, and no matter who you love, every person in this country enjoys full and equal civil rights. Conservative courts are determined to impose their ideology to deny rights to LGBTQ individuals and we must resist these attacks together. The above is not the expression of a radical Muslim just as it would not apply to a conservative Christian. AFA, Mr. Groening and Ms. Gabriel should do what I do: Quote something with a link to the source and then comment on specifics. However, they are not interested in accuracy. They want to denigrate people that they do not approve of. Doing so has had enormous economic benefits for Gabriel and probably attracts donations to AFA. The only radicals around here are Groening and Gabriel!